Have you ever had the feeling that our society and economic system may collapse at any moment? If you have, you’re not alone, because many people are preparing every day for the end of the world. Call them preppers, doomsdayers, militias, or survivalists, but if anything ever does happen, they’re the ones who are going to be ready. Nobody ever wants to be faced with a survival situation, but it’s much easier to handle if you are prepared for it. One of the most basic items to have ready is a “bug out bag”, or survival backpack. When disaster strikes, you grab your backpack and take off. This backpack should have all of your basic necessities to give you time to make it to a safer place. Survival backpacks come with varying amounts of pockets and storage, gun compartments, hydration, and maybe even first-aid supplies or food. Some just come empty, and you can pack them with the supplies that you think you need. If you’re in the market for the best survival backpack for the end of the world or you just want a great pack for hunting, hiking, or camping, you’re in the right place. This is a great quality survival backpack from Explorer that doesn’t have a lot of bells and whistles, but it’s ready for action. This backpack doesn’t come with a hydration bladder, but it’s hydration ready. All you need to do is purchase one separately and slide it into the hydration compartment. You’ll love carrying your water in your pack instead of in bottles or jugs. It’s much easier to keep moving. Don’t let the extra-thick waist straps fool you, because they’re really gun compartments. You can fit one pistol with ammo on each side of your waist, and nobody will even notice. They’re also nice and easy to get to in case you need them. You can get this backpack in six different colors to match your preference or local terrain. Choose from Camo, Olive Drab Green, Black, CT Tan, MultiCam, or Woodland Digital. None of the available colors will attract any attention, but they’ll help you blend into the countryside. 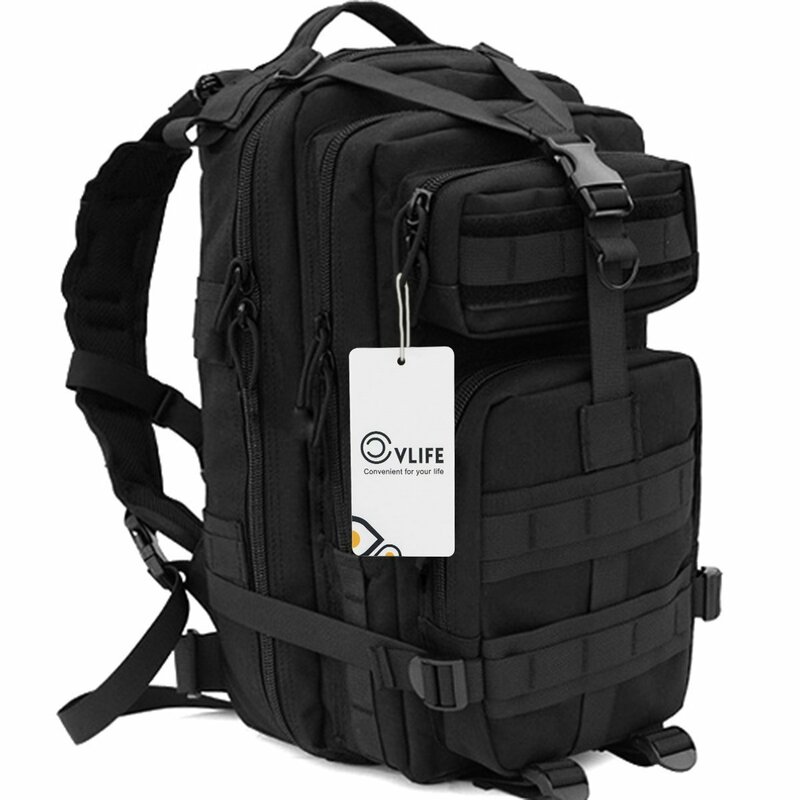 This survival backpack from CVLIFE has a large 30 liter capacity, so you can bring along all of the gear that you want to. To keep this backpack both tough and waterproof, CVLIFE uses 600D Nylon material. Nylon is not only incredibly strong, it’s also lightweight, which is a great advantage for any backpack. This pack is light, tough, and built to last. The key to hauling around large heavy loads on your back is to have your pack weight distributed correctly on your body. That means that you need more than just shoulder straps. This backpack has padded and adjustable shoulder straps, an inch and a half waist belt, and a one inch sternum strap so you can properly adjust the pack. With correct strap adjustment, this pack will do you a great job over any long distances. Whether you prefer black or camouflage, you can get this great survival backpack in your choice of color. It’s available in CP - a green jungle camo print, ACU - a grey digital camo, and of course all black. This survival backpack from Black Ops has everything you need to just go. If you don’t want the hassle of buying all of the supplies for your pack, this one’s already full. Just about the only thing that doesn’t come with this survival backpack is a water bladder, but it’s ready. Just buy one separately fill it up with water, and slide it into place. Now you’re really ready to go. The backpack here is made from 600D high density polyester. It features some padded adjustable shoulder straps, side load compression straps, and a 2000 cubic inch total storage volume. Once you get to where you’re going, you’ll probably want to take out all the supplies and use it to haul other things. I mean it. Everything is here, and I’ll try to describe what you get. You get 72 hours’ worth of food and water. The VAS 25 piece water box, the VAS 27 piece dental box, the VAS 92 piece fire box, tools, lighting, communication, shelter, first aid & emergency, and cooking and eating supplies. Some of the major items are a cable saw, survival knife, duct tape, paracord, a transistor radio with batteries, and a survival slingshot. This survival backpack is ready to go. This survival backpack from Wise isn’t just a pack, it contains supplies to survive for five days, and even a pack of playing cards to pass the time. The Wise survival backpack is a quality pack. The durable nylon exterior keeps moisture out while protecting everything inside. Adjustable shoulder straps, two exterior pockets, and side and top handles are great features in addition to the large dual storage compartments. You might not want to wait for a disaster to use this quality backpack. This survival pack comes with a bunch of supplies including food. You get 32 meals, which is enough to feed two people for 5+ days, plus a small stove with fuel pellets, matches, a stainless steel mug, blanket, poncho, first aid kit, and a respirator filter. You also get five daily portions of water in case you forget to grab some or add a water bladder to this pack. Wise’s survival backpack is a great choice for those who want to purchase a complete pack that still has room to add items to it. It has a shelf life of 25 years, so you can prepare it once, put it aside, and rest assured that it’s there if you need it. You won’t have to buy any more supplies for 25 years. If you want a very large backpack that’s extremely versatile, you should definitely check out this backpack from CVLIFE. If you’ve had problems fitting everything you need in your other packs, you should buy this one. At a whopping 50 liters in size, there’s plenty of room inside this pack to bring along all of your gear. Never feel anxious about leaving those few important items behind ever again. You may not need the full size of this backpack all the time, but don’t worry because you can make it smaller. Just remove the three detachable molle pouches. There’s one on the front and two on the sides that can be removed with a couple of quick snaps for your convenience. Versatility is what makes this survival backpack really stand out. With a backpack of this size, you need to be prepared for some heavy loading. The best way to handle larger loads is proper placement with straps. This pack has a padded hip belt, a chest belt, and two padded and adjustable shoulder straps so you can handle the biggest loads possible with minimum discomfort. If you’ve been looking for a great survival backpack, you can’t go wrong with any of the packs I’ve reviewed above. However, I’m going to name two winners for the Best Survival Backpack. If you’re just looking for the pack and are planning on filling it up with all of your own supplies, I’d recommend buying the CVLIFE Outdoor 50L Military Rucksacks Tactical Backpack. It’s large enough to fit all of your supplies, hydration ready, and it’s extremely versatile for everyday use. If you’re looking for a pack and a good start on your emergency supplies, I recommend the Wise Food 5-Day Survival Backpack. It’s got five days’ worth of food and water plus it has many of the emergency supplies you need. With a 25-year shelf life and a surprisingly affordable price, the Wise is the best survival backpack value.